This entry was posted on Monday, August 29th, 2011 at 12:54 and is filed under GOP Candidates, Politics. Blind Faith, False Prophets, We Got it All! As we see so often in politics, there will always be those who take their advocacy too far, and see their candidate as flawless. Perry now has a growing throng of people who fit the bill. Much like many of us have grown frustrated with the so-called “Paul-bots,” so too have I found that some of Rick Perry’s supporters deserve similar poking. 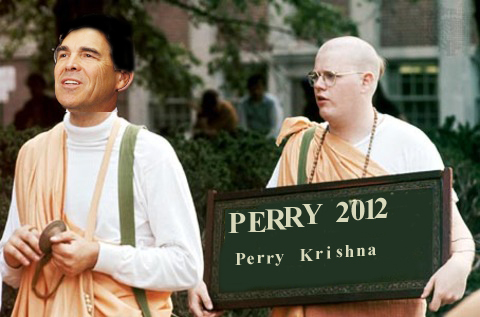 In their honor, I’ve dubbed them “Perry-Krishnas” for their cult-like support of their chosen candidate. I have no problem with ordinary Perry(or Paul) supporters who are willing to advance an argument, but the senseless rumor-mongering of the Perry-Krishnas must be rejected. I’ve found an image that really captures their spirit, and I hope it will help you spot them in a crowd!